Self-enclosing bag stuffs into a rectangular pocket with a fold-over flap. Worked in the round. 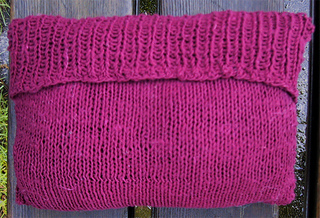 This bag will stretch to hold all your yarn purchases. The sturdy handles will take the weight and they are long enough to sling over your shoulder. When out of use, it folds into the inside pocket.